Victor and Eli started out as college roommates - brilliant, arrogant, lonely boys who recognized the same sharpness and ambition in each other. In their senior year, a shared research interest in adrenaline, near-death experiences, and seemingly supernatural events reveals an intriguing possibility: that under the right conditions, someone could develop extraordinary abilities. But when their thesis moves from the academic to the experimental, things go horribly wrong. Ten years later, Victor breaks out of prison, determined to catch up to his old friend (now foe), aided by a young girl whose reserved nature obscures a stunning ability. Meanwhile, Eli is on a mission to eradicate every other superpowered person that he can find - aside from his sidekick, an enigmatic woman with an unbreakable will. Armed with terrible powers on both sides, driven by the memory of betrayal and loss, the archnemeses have set a course for revenge - but who will be left alive at the end? After finishing the final page at 2:30AM, with work looming that day, all that was going through my mind was "wow." Vicious by V.E. Schwab is a book that I normally would not have picked up if I came across it in a bookshop. I'm not really into superheroes and Marvel/DC comics (and to be honest, I still can't tell the two apart). But after having heard so many good things about this book from the book blogging community and thoroughly enjoying the Archived duology (I need a third book! ), I was intrigued enough to pick up the book. Vicious follows the lives of both Eli and Victor, both ten years ago in the past as well as in the present. The pair used to be best friends in University - both brilliant and like-minded, always wanting to discover what's beyond the limits of what's possible. The trigger point was their term thesis, where their separate topics merged into one - the possibility of the ExtraOrdinary. Then disaster struck and their friendship was forever severed. Ten years later, their paths once again cross, setting off a chain of actions towards the finale showdown between the pair. V.E. 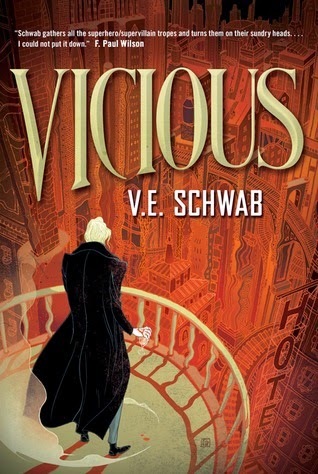 Schwab's writing style once again shines, making Vicious a gritty fast-paced story into the supernatural. I really appreciate how much background groundwork Schwab had evidently put into the world building and character profiles. Everything feels so real and the book is really a feast for the senses. Another highlight of this book is the dynamics between all the characters. From the deep complex relationship between Eli and Victor, to those amongst the secondary characters, not a single one feels superfluous. Ultimately, the themes of morality, religion, good vs. evil, are the main centrepieces of this book. The plot is constantly turning and bending, and it is really mind-twisting, knowing that not everything is as it seems on the surface. Life - the way it really is - is a battle not between Bad and Good, but between Bad and Worse. One thing that jarred me towards the beginning was the alternating timelines. I found myself more interested in the present storyline and always had to bite down annoyance when the chapter ends and the next one throws us back into the past. But this is very minor and other than that, I couldn't really find much else I disliked about this book. In conclusion, this book is absolutely amazing and I can't recommend it enough to everyone. Even readers who are not usually into this type of book: please do take a risk, and this book may just pleasantly surprise you.